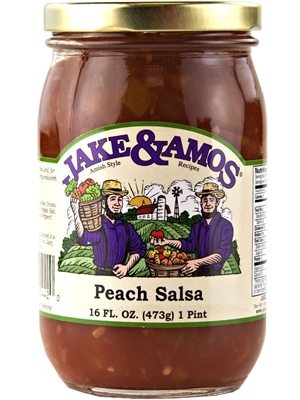 Jake and Amos Peach Salsa is an all natural, cool and refreshing salsa that truly brings the taste of tree-ripened summer peaches to your table. This salsa is perfect with tortilla chips, on salads or as a sandwich topping. Ingredients: Tomatoes, Peaches, Onions, Sugar, Tomato Paste, Cider Vinegar, Salt, Garlic, Citric Acid, Jalapeno Peppers, Seasonings.